My favorite summertime fruit is bing cherries. We are lucky in Colorado to get delicious Palisade cherries and peaches towards the end of the summer so I am always looking for ways to incorporate them into my meals. I've even used these roasted cherries in my homemade yogurt, it was delicious! This dish is very light, sweet and savory and is incredibly easy to make. Hope you all enjoy! Cover cherries in melted schmaltz and spread evenly on baking sheet. Top with a couple pinches of rosemary and roast for 10 minutes or until soft. Meanwhile, heat remaining schmaltz in a skillet and season fish with sea salt on both sides. Add haddock to skillet and cook for 3-4 minutes on one side and flip, cooking about another 1-2 minutes on the other side. 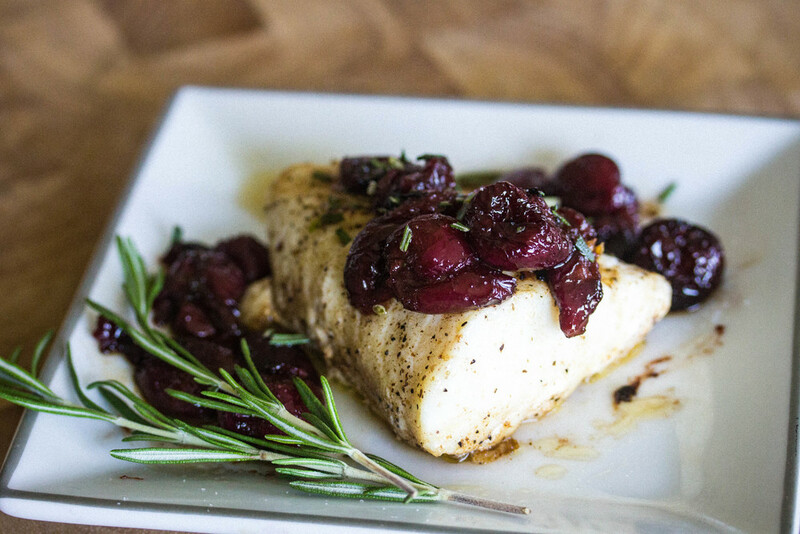 Remove fish from skillet and top with roasted cherries and remaining rosemary.